On the Fox News Channel last Friday former Secretary of State James Baker recounted a story about a visit to England several years ago when President Ronald Reagan visited with Queen Elizabeth. As is customary during such visits the Queen and the President were to be photographed together. Since both enjoyed horseback riding it was decided to have a photo op with the two of them riding horses on the grounds of Windsor Castle. 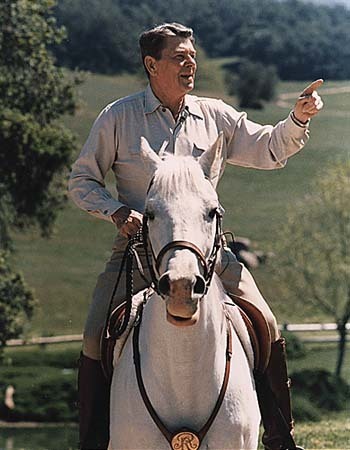 The President and the Queen mounted their horses and following the photo session rode off away from photographers.